What is particularly remarkable about Radhanath Swami’s The Journey Home is the striking detail of his descriptions of his daily existence on the spiritual path…. All of these is set forth in an elegantly clear[language] that completely avoids ambiguity. — CHARLES S. J. WHITE, PH.D., Professor Emeritus, American University, Washington, D.C.
An amazing story of a man whose life is completely controlled and governed by God and how he reaches his ultimate destination… HH Radhanath Swami’s story is truely fascinating and glorious! Radhanath Swami Maharaj gives very wonderful details of the journey, i am amazed to see Maharaj’s strong memory of the incidents happening since his childhood. The beacon light for spiritual seekers…. I have read this book and found it interesting . I would recomend this book to all those who are eager to tred the path of spirituality . The metaculous details in the book take reader to real situation. Really Radhanath Swami Maharaj’s writing is very unambiguous. It makes the things very clear. Yes, that’s amazing. 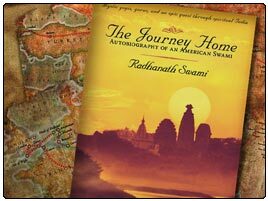 I am also struck on how meticulously Radhanath Swami pen’s each of his day’s experiences during his travels. Those days would have meant so much for him that he remembers it so well. Well said. The lessons contained in this book can be adapted to our day to day life. It’s nice to see maharaj’s book is inspiring people all over the world. Every page in this book has an important lesson. Thanx to Radhanath Swami. It is a life changing book. Amazing words from Charles about Radhanath Swami’s book. Indeed, one of the most striking thing about Radhanath Swami’s book is the clarity of thought, it’s crystal clear. Amazing book – a must read for all. Most amazing thing is that Maharaj still remembers the prayers that he had offered in the situations that he went thorugh during the journey. True, the description makes you feel that you are there, you can see everything in front of your eyes. amazing story telling by HH Radhanath mahraj, while reading one would easily get lost in Maharaj’s adventures to seek truth. When i took the book to read, i could not stop reading.It is written in such a way giving every detail of Radhanath swami’s journey. I enjoyed the book. even after reading it once, i now and then open it and read and still i get lost in reading.I gave the book to one of my friends he also had same opinion, he subsequently recommonded the book to her wife.This is proof of how well this book is recieved by the readers. Thank you Radhanath swami for sharing your spiritual journey with us in the form of this valuable book, it throws light on so many issues one may face during his own spiritual journey and by doing so it prepares any one willing to take to spiritual path, for taking all the challenges which may come in the way,with proper understanding. I have read Radhanath Swami’s book and I perfectly agree with Mr White’s comment about it. The power of recollection displayed by Radhanath Swami points to the extreme emphasis he has placed on all the recollected incidents. I heard that the author is very soon going to come out with his second book. Is this true? Could anyone please guide me to a place where i can get a copy from? Wonderful book – I have some friends who could just not leave the book till they finished. They read end to end. A must read for all. Indeed this is one of the best books I have ever read. I agree with Mr. White. Maharaj has amazing narrative skills. A must read book for all. The best thing about this book is how Radhanath Swami derives lesson from each of his experience and his determination to reach his goal inspite of the difficulties. It is amazing how the author has written this book in thorough detail. It;s true. Radhanath Swami has iwritten such a magnificent yet humble account of his deeply spiritual experiences that even the common man can understand and appreciate his journey. its so true, the reviews talks about Radhanath Swami’s clarity of thought. The comments given by charles is exactly true about the Journey Home. Anyone who reads the book will understand this fact. It is written in such a wonderful way that everyone tries to look into their own spiritual path. Great messages can be found in this book. Yes. The narration of the book is heartfelt, endearing and inspiring. Thank you! You are helplessly bound to accompany Radhanath Swami in his search of absolute truth while he writes each and every detail of his treasure hunt. Magnetism of this book doesn’t allow you to keep it away.